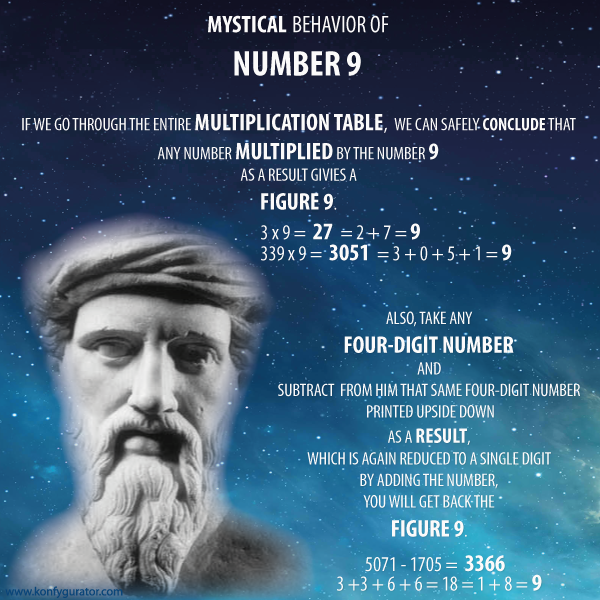 Did you know that the number 9 behaves mysticaly. The fact which speaks in favor of this is that you can not detach from the use of this number when mathematical multiplication operations are done, whatever you do. If we go through the entire multiplication table, we can safely conclude that any number multiplied by the number 9 as a result givies a value with which mutually collection and discounting to the single digits again, gives a figure 9. Take any random number and multiply it with the number 9 and then reduce it by adding the scores obtained in the single-digit number and will receive again 9. Also, take any four-digit number and subtract from him that same four-digit number printed upside down, of course, by taking a smaller number of larger, as a result, which is again reduced to a single digit by adding the number, you will get back the figure 9. You can check on any randomly selected as a four-digit number so finally will always appear nine.